Popularly known as the High Court Jalebi, this stall — Jai Maajisa — is quietly tucked away on the High Court Road. Grab a samosa or a kachori and we’re telling you it’s heaven for INR 10! If you are seeking hot samosas and jalebi when you are in Old City, High Court Ki Jalebi is an answer to all your gastronomical prayers. 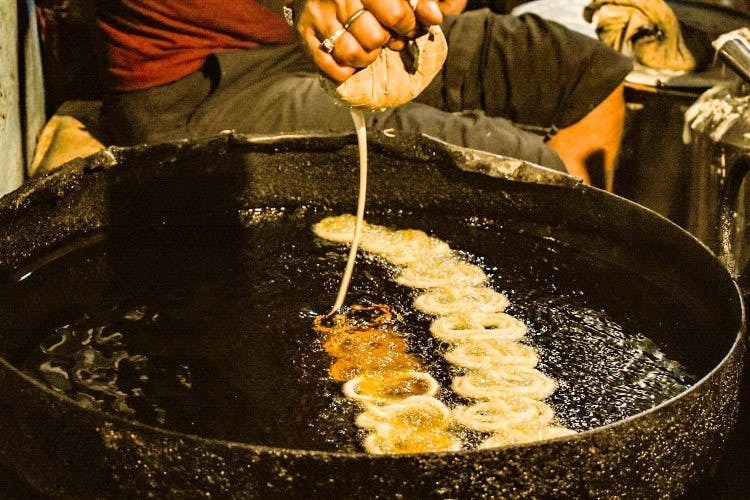 Originally a tiny kiosk in front of the High Court, it grew to a significant size over 50 years but is still known as High Court Ki Jalebi (a name it gained because of its location. Its actual name is Jai Maajisa!). But what’s in a name! When Pradeep Nath’s (current owner) father was working with a caterer in Hubli, a Hyderabadi caterer loved his cooking so much he took him back with him. Then, Pradeep’s father opened a little kiosk which we now know as the High Court Ki Jalebi shop. We were greeted by Pradeep Nath the moment we walked up to the shop and he recommended samosa and kachori, plus we already had our eyes on the jalebi. The samosa and kachori arrived on a paper plate with two kinds of chutney —green chili chutney and a red (sweet and tangy) one. Both the dishes weren’t oily and greasy which is a total win if you ask us. The stuffing was filling, and we loved how they tasted with our red chutney. But honestly, it was the green chutney that won our hearts. We’ve tasted nothing quite like it — spicy, slightly minty, and full of flavour — it gets an ecstatic nod from us. We moved on to the jalebi next, and it was love at first bite (cheesy but true). It was thin, crisp, and not too sugary. In fact, we packed home some jalebi and khara for midnight snacking. We wish there was a basic seating area.